Don and Marge Gibson examine the young bald eagle when she was admitted on Sunday. This beautiful young Bald Eagle would have died this weekend, if it were not for a family of everyday heros from Iowa that stepped up to the plate to rescue and help transport her to REGI. Our hats off to the Bill Obenauf family for their tenacity to get her help. It turns out, Bill is a well known radio personality on 97X in the Quad cities. He gives a terrific description of the rescue and how they came to find the bird in the link provided. http://www.2dorks.com/Eagle.html I urge you to read it as it is well done and has many photos of the rescue. Their response is testimony to what kindness and generosity can accomplish. In the remote areas of our state we are blessed with plentiful and a huge diversity of wildlife and few people. That situation becomes challenging when wildlife becomes injured and needs help. REGI is located over 3 hours from the site where this youngster was found on an ATV traill. 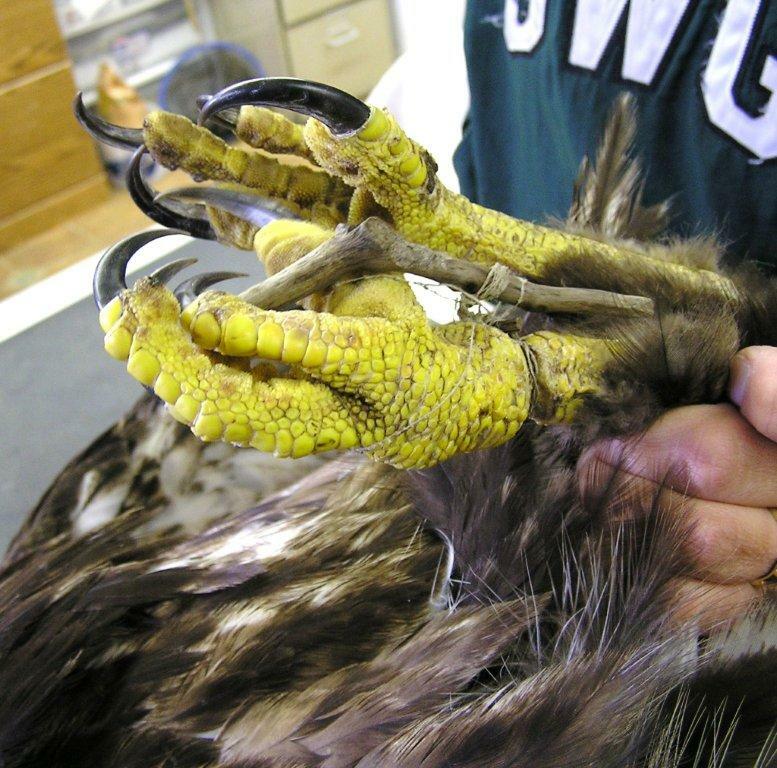 The snare, which had been there for weeks, had embedded into the eagles leg. 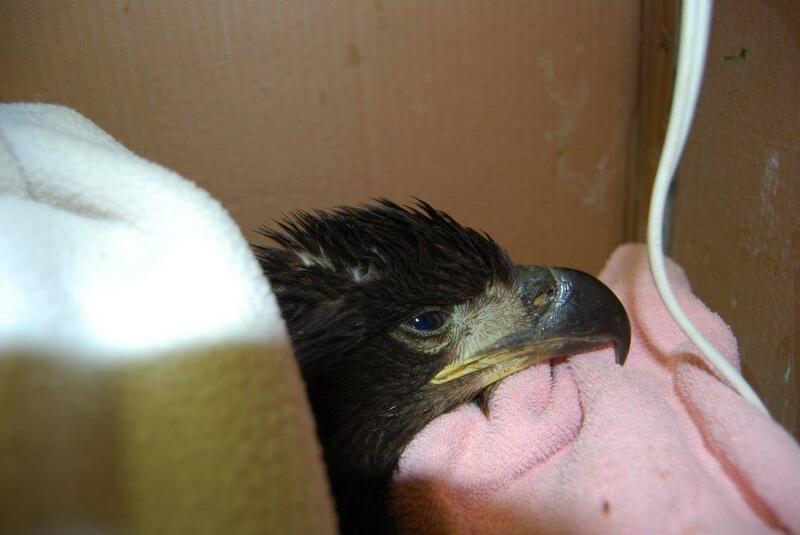 With her leg immobilized, the eagle was not able to capture fish or eat and therefore was slowly starving. 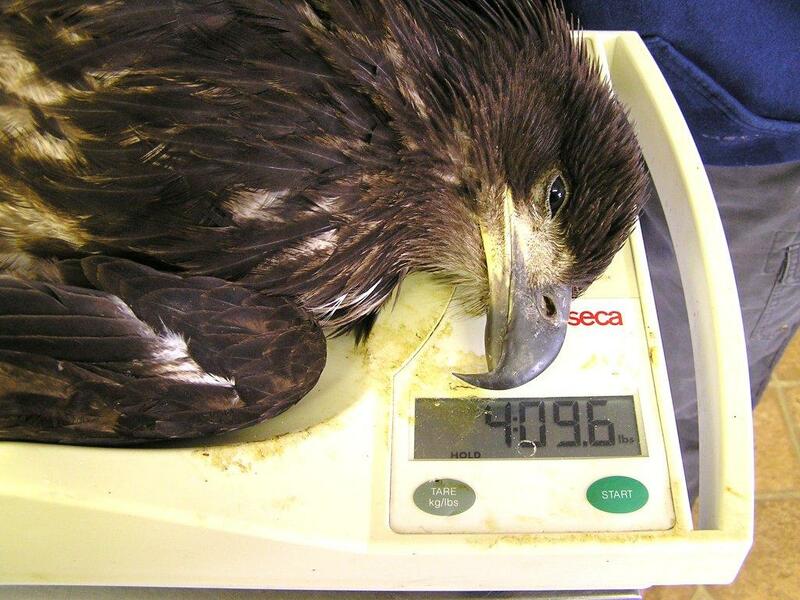 Weighing in at 4 lbs this young Bald Eagle was near death when she arrived at the REGI facility. She should have weighed about 10 lbs. 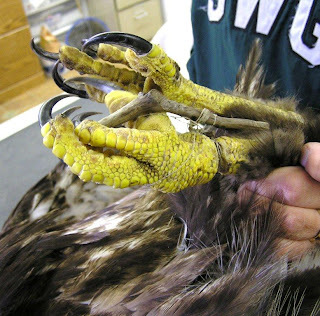 Embedded into the leg of a young Bald Eagle, the string was beginning to cut off circulation to the eagles foot. The snare was a homemade version made from string and a stick. We are not sure what the target was for this snare, but we are pretty sure it was not a Bald Eagle. Sadly, this type of thing happens far to often. We urge folks to realize that wildlife may accidentally encounter such things and die when they are unable to extricate themselves. In the great northwoods of WI, that animal may well be an threatened or endangered species. Tired but warm, alive and happy to have food in her crop, this young eagle now has a future. The good news is, while she is still in critical condition, the brave young eagle is doing well. She is still on heat and being tube fed liquid food several times a day. Due to the level of starvation she suffered, she is unable to digest the fish/meat that would be her natural diet. She has a long road to recovery ahead of her but we are cautiously optimistic for her future. Check for updates often as she progresses and regains her health. The weekend was crazy busy with many new patients being admitted. Holidays are always busy as that is when families are together and outdoors and encounter wildlife with injures just as the Obenauf family did. 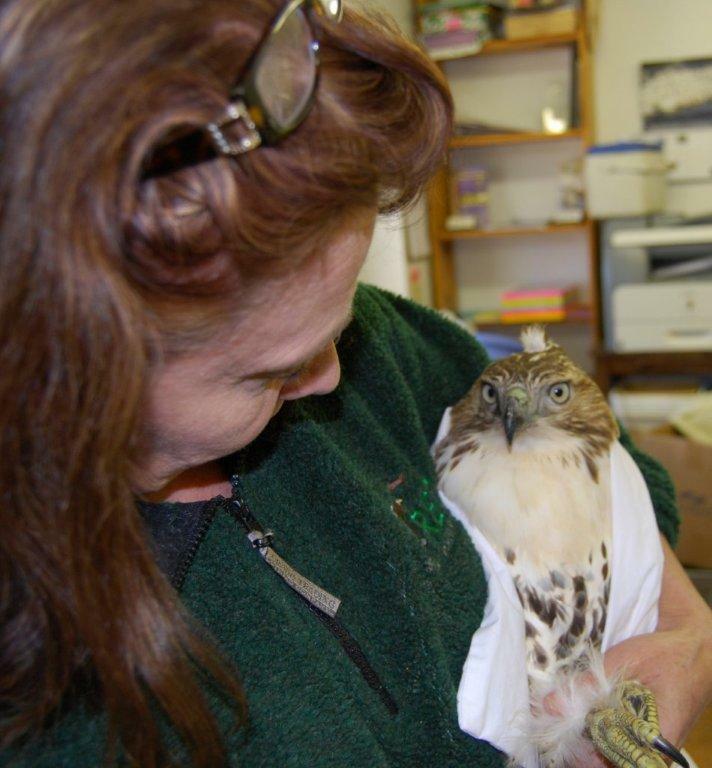 Several Red-tailed hawks, like the one Marge is holding above and Broad-winged hawks were admitted over the weekend. Broad-winged hawks are beginning their southward bound migration and we can expect many more to come in the next several weeks. Broad-winged hawks fly all the was through Mexico, Central America, and can go as far as Argentina before they rest for the remainder of the winter. In spring they will head up north again to breed and raise their youngsters. This beautiful female Nighthawk made contact with a car and broke her wing as she was swooping through the night air hunting insects. 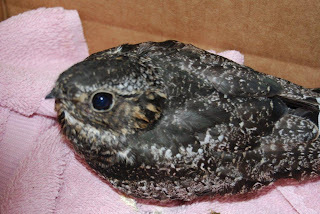 Nighthawks eat only insects and are hugely beneficial to humans. We hope for a full recovery for the nighthawk, but she will miss migration. She will either stay with us for the winter or be transported to the far south to catch up with others of her species. Central America or the Caribbean will be her final destination for the winter. 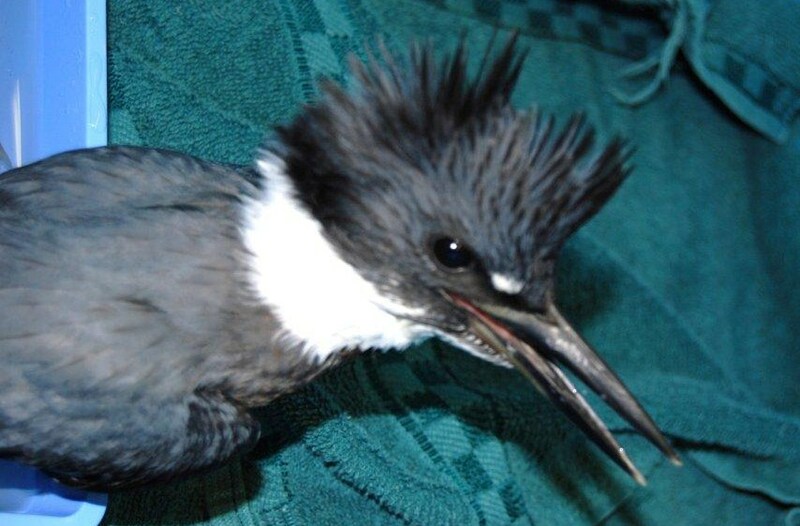 This Belted Kingfisher is a handsome and spirited bird. She broke her wing but is rapidly improving. We raised 7 young Kingfishers this year at REGI. They were released 2 weeks ago. We are told they are happily fishing and squabbling with each other, as siblings of all species seem to do, near their private land release site. Ruby-throated Hummingbirds are delicate in stature but strong in character. These two were admitted with wing fractures and are doing well. We love sharing our patients and their stories with you. We have lots more to tell you including several popular patients that have recently been released to the wild. As for now, our patients need attention so that will have to wait for another day. Thank you everyone for caring about wildlife and supporting our efforts with native wildlife. REGI receives no state or federal funds even though all of our patients are state and Federally protected species. It is only through your help that non-profits such as Raptor Education Group, Inc (REGI) can continue our important work.